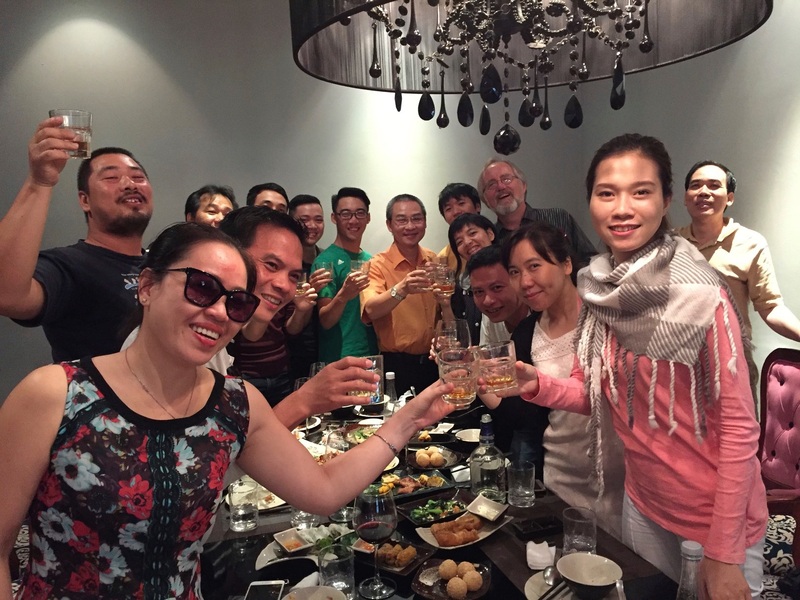 Our memorable bon voyage party with the Hà Nội New Music Ensemble after two months of hard work together. 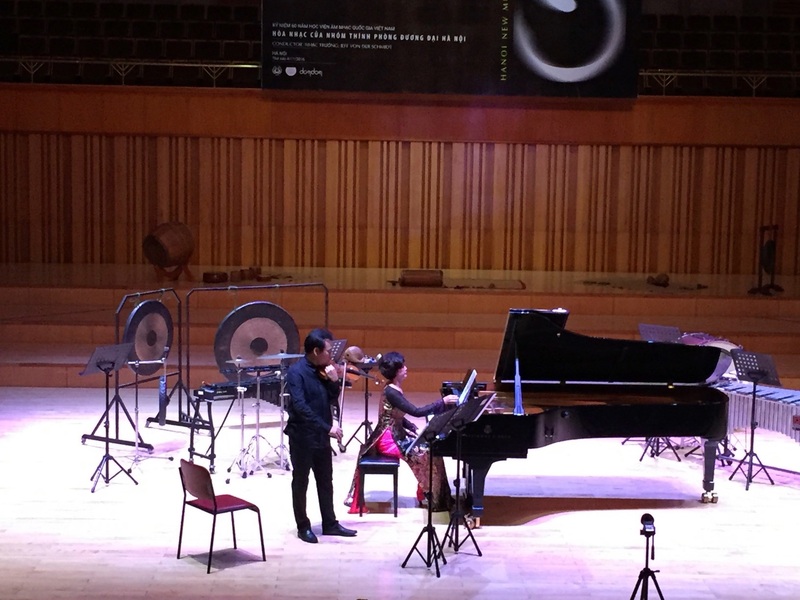 Cellist Trinh Đạo’s energy shines as she masters Voyage, a major solo challenge by composer Tốn Thất Tiết. Pierre Boulez was right when he said that being creative is like riding a bike. Either you keep moving forward or you fall off. Traffic in Hà Nội predicates itself on forward motion (stepping back into the road invites danger, just keep moving forward with an oozing walk and all will be well). 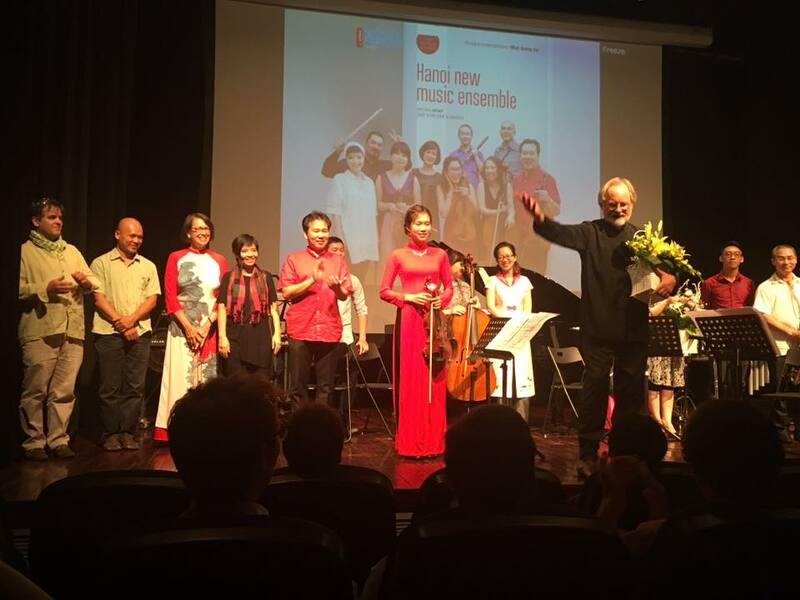 What encourages me about the next steps for the Hà Nội New Music Ensemble is its progress over the two months we worked together. As well as the amazing full capacity audiences. 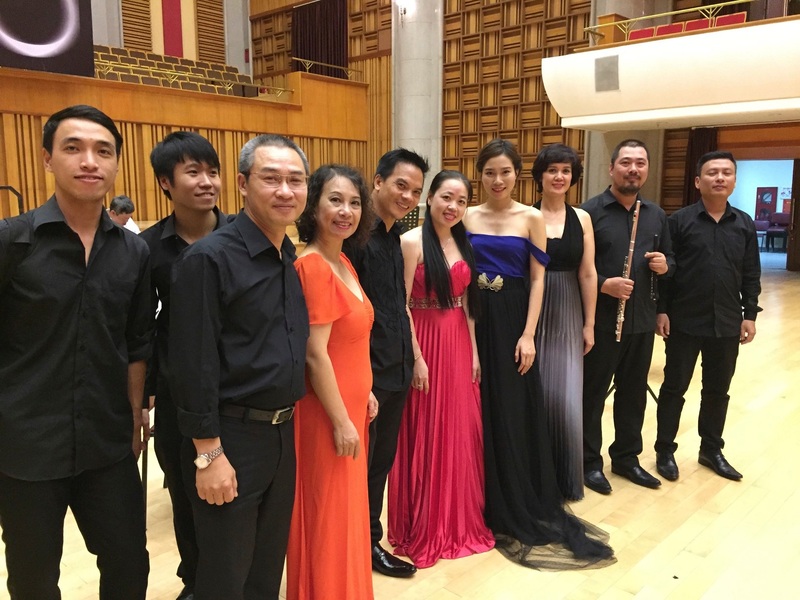 It’s a huge reward that the Vietnamese public gets what the Hà Nội New Music Ensemble is about and supports what we mean for their mutual cultural identity. Exciting! I have often said that my blog posts, taken as a whole, are inspired by answering the number one question I have received over a thirty year career. Namely, how do I create a program? And, make no mistake, programming for Việt Nam is my greatest challenge. 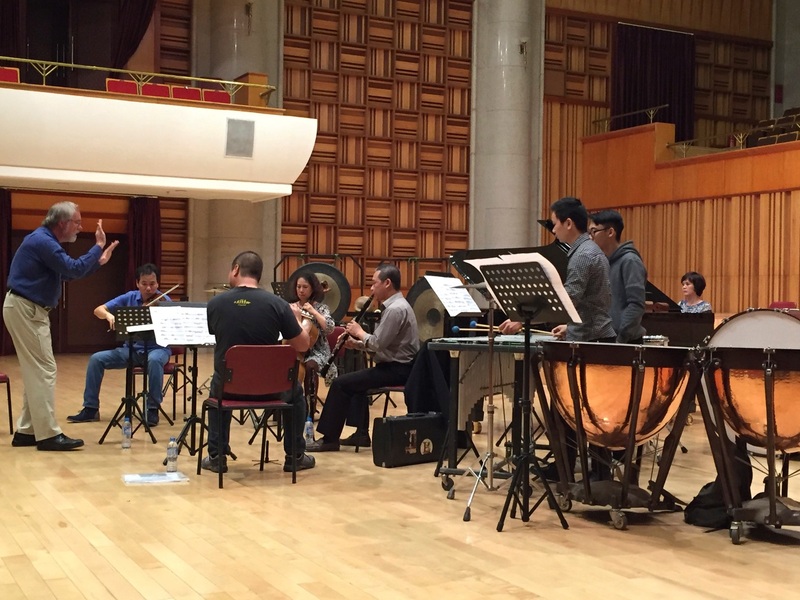 Rehearsing Boulez Dérive 1 in Hà Nội. The answer, for me, is found in coming to terms with the disruption of cultural continuity caused by the long history of foreign war that shapes Việt Nam’s identity. The Chinese for 1,000 years, the long and extractive French colonial era, the World War II occupation of the Japanese, the French again hoping to reclaim their Lost Empire followed by the Americans hoping to stop the spread of communism, then the Khmer Rouge Cambodians, and then Deng Xiao Ping testing the Russians with a three week Chinese incursion into Northern Việt Nam. 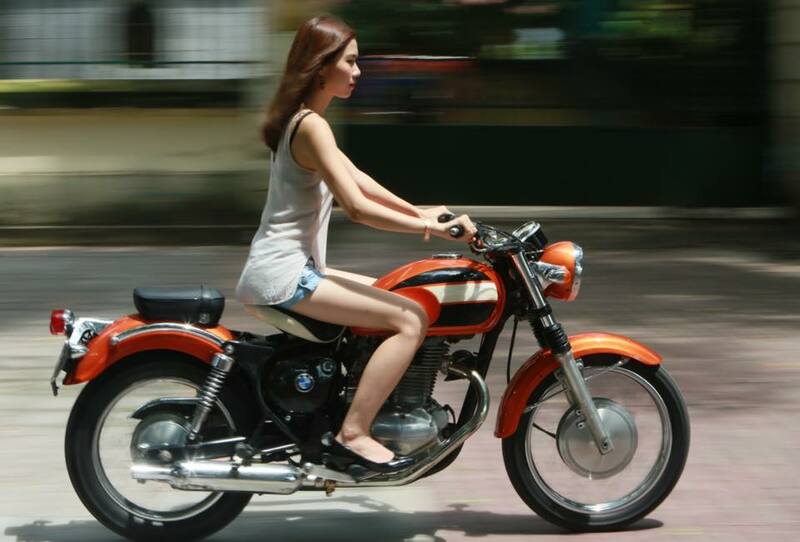 Through all of this, the Vietnamese remain the most gentle personalities I’ve ever encountered. Truly the stuff of inspiration in a world that still thinks flirting with madness is a good strategy. I’ve written extensively about these circumstances regarding the new music community in earlier posts. But the issue of musical continuity remains acute for ancient Vietnamese music. 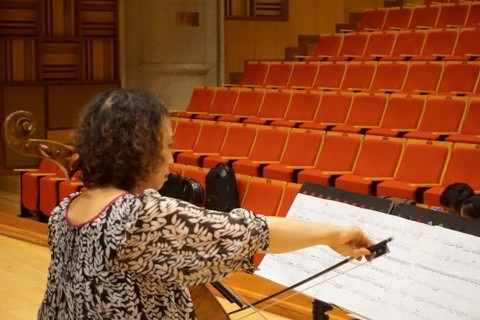 The French created an obnoxious reality of often using Vietnamese traditional music for illicit opium and prostitution and the Russians transformed much of the music into socialist realism, cutting away the genuine root of the music in many ways. 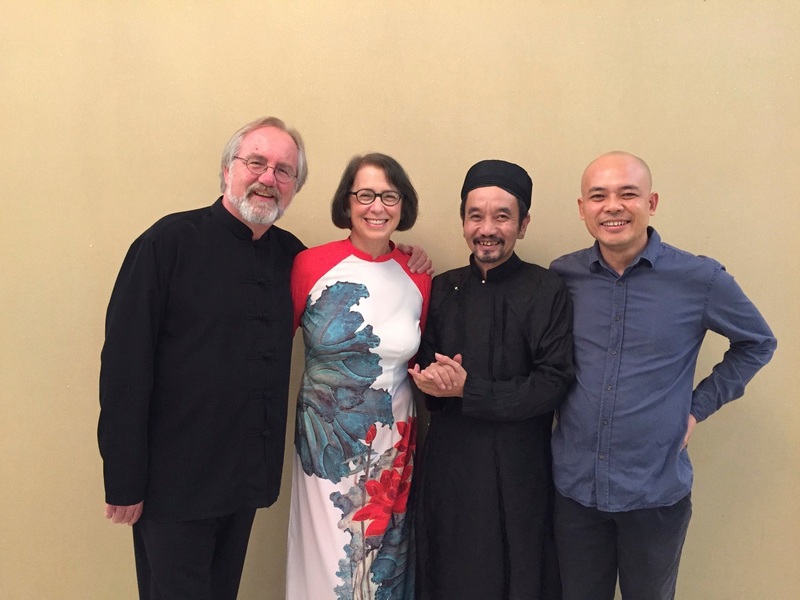 Joining forces back stage with Jan, Đàm Quang Minh and composer Vũ Nhật Tân. Reviving historically informed performances of old Western music is a relatively easy task. Four years of studying Latin with Jesuit teachers as a young boy gave me the tools to read the texts necessary (something I’ve been truly shocked to discover many people with old music bona fides can’t do, but that’s another story entirely). One can piece together what is needed, and with research libraries in abundance, a trip to an appropriate library will yield inspiring results. 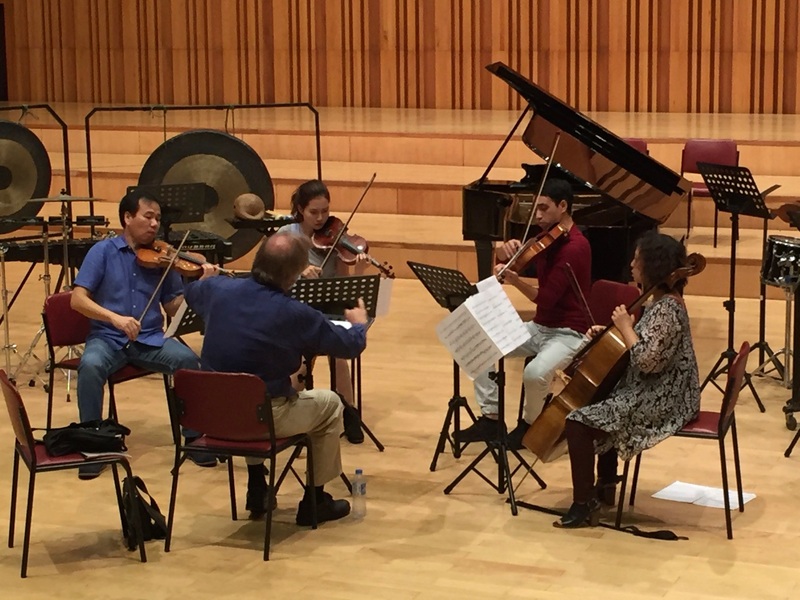 Or just check in with the work list of the Mad King, Sir Peter Maxwell Davies, and you’ll get a sense of the Western take on blending the ancient with the new. Things for Vietnamese ancient music are by no means so straight forward. Good luck finding a text you can read, unless your ancient Nôm calligraphy is up to snuff (more on that in another post). So capturing the memories of old musicians is a now or never proposition. Stepping into this situation are my friends Đàm Quang Minh and composer Vũ Nhật Tân, who co-direct the Ancient Ensemble of Tonkin. Tân and Minh introducing our first collaboration of ancient and new Vietnamese music. 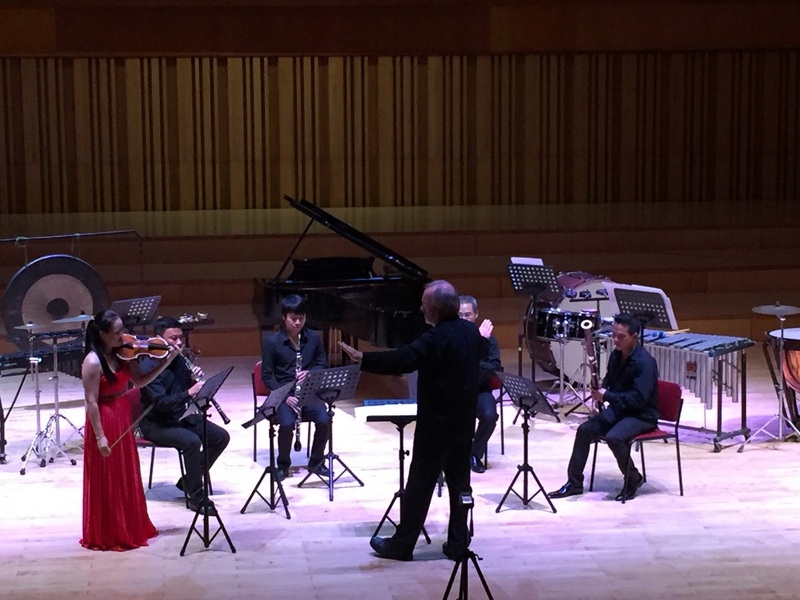 Before I boarded my flight from Los Angeles to Hà Nội, I had laid the groundwork for this collaboration as part of my continued interest in the development of the Hà Nội New Music Ensemble, and look for a follow up post as well. But little did I know what was in store for everyone! 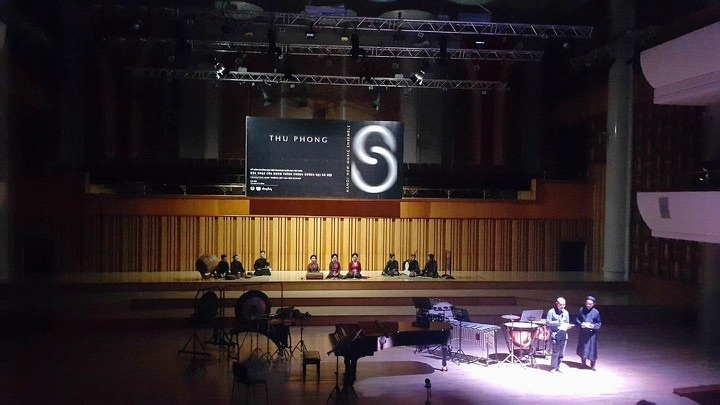 Đàm Quang Minh reached back as far as was possible to begin our work together with a performance of The Communal House Songs, the oldest known Vietnamese music. Dragon drumming, gongs, and cymbals punctuated the three central singers you can see in the above photo. They collectively blew the roof off the auditorium! And if you look closely at the above photo, you’ll see an impressive banner with white lettering against a black background. Thu Phong means Autumn Winds. The Vietnamese have a charming habit of producing a banner for every concert (not to mention showering me with a florist shop of bouquets as we take our bows!). And ours was the best banner I’ve ever seen, with its suggestion of the yin-yang symbol. 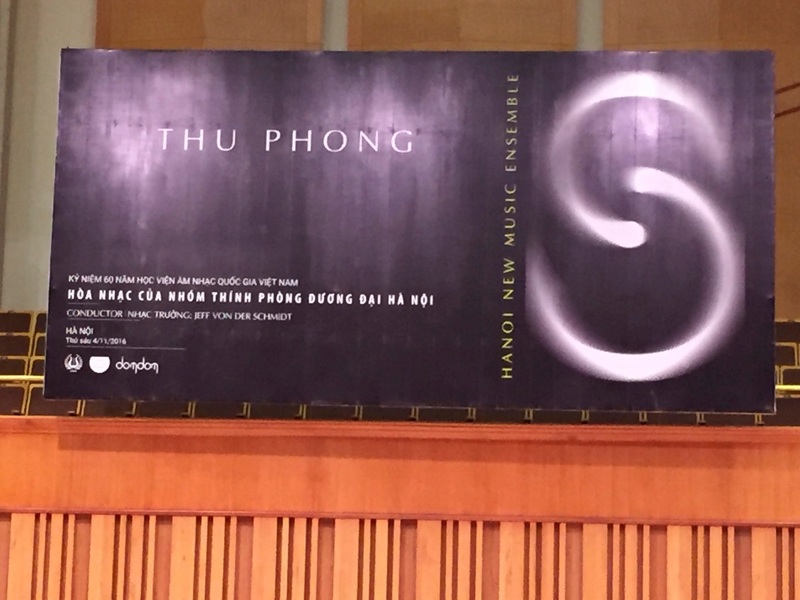 Thu Phong is the title of a piece by Tốn Thất Tiết for violin and piano, which by design, immediately followed The Communal House Songs. Tốn Thất Tiết’s Thu Phong with Pham Trường Sơn and Qùynh Trang Phạm. And so to answer the question as to how do I program, I have to stress that larger cultural realities must override any musical favoritism. And another career tip, if you mind. I always am guided by the opposite compass, the absolute abstract theory of the music under consideration. Somewhere, in the deep structural details, lies the skeleton key of guidance to create a program that will change lives. Combining the two simultaneously, cultural reality and abstract theory, is essential. Easier to write than to accomplish, I’m afraid. Getting older helps! Because anything else is, for me, the commodifying of an art form. Which leads only to a dirt road with no exit possible, as far as I’m concerned. Culture does not survive nor advance by accident. Guiding a new string quartet of Nguyễn Minh Nhật. Stravinsky as prelude to Boulez after intermission. 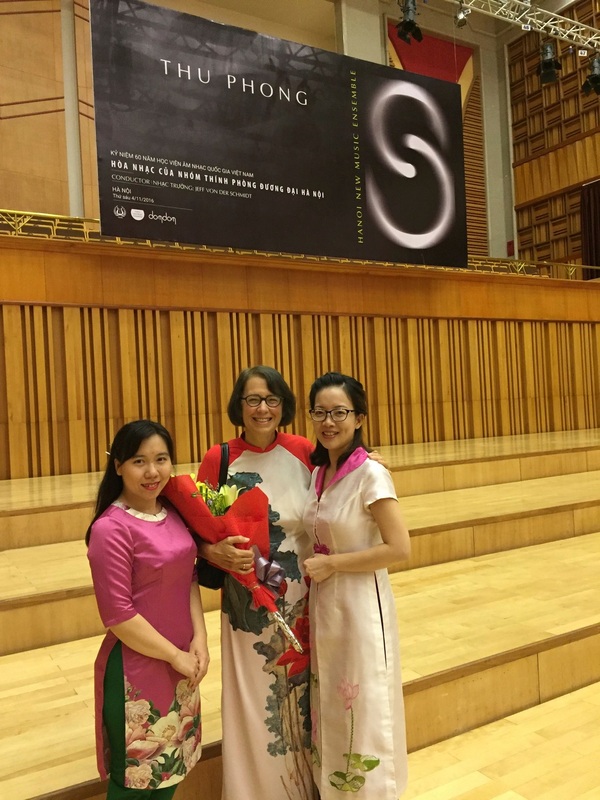 I am inspired by three generations of Vietnamese composers. Nguyễn Thiên Đạo and Tốn Thất Tiết, who moved to Paris, Vũ Nhật Tân and Trần Kim Ngọc who were encouraged by Tiết and studied composition in Germany and the United States and a bright young talent, Nguyễn Minh Nhật, who at 18 is studying at the Manhattan School of Music in New York City. 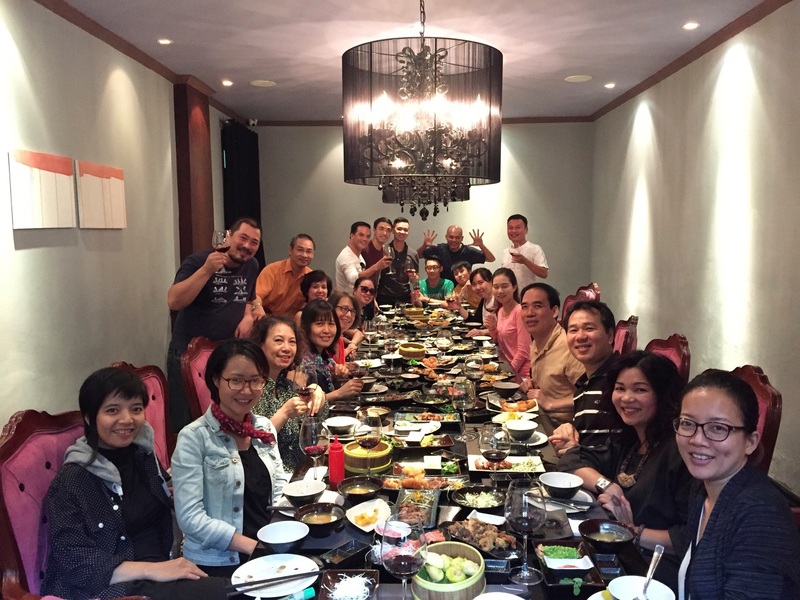 As good as Vietnamese cuisine is, I don’t get on the plane to have another bowl of noodles! A group bow at our October concert at L’espace. So the stage is set for exciting next steps. My inbox is already full of news and I’m patiently awaiting ideas for the future from my friends in Hà Nội, which is full of promise. Enjoy some happy post concert moments! 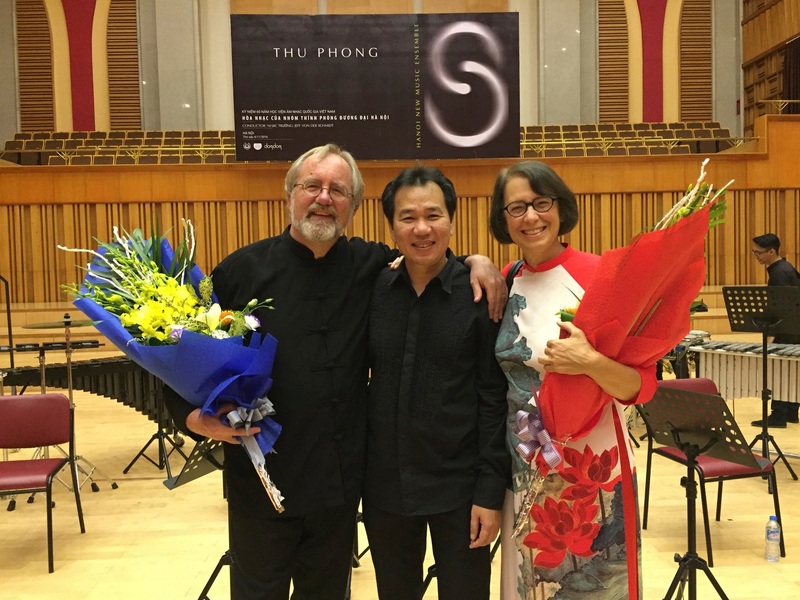 Jan with cellist Giang Dương and pianist Tam Ngọc Trần. A happy impromptu group photo. 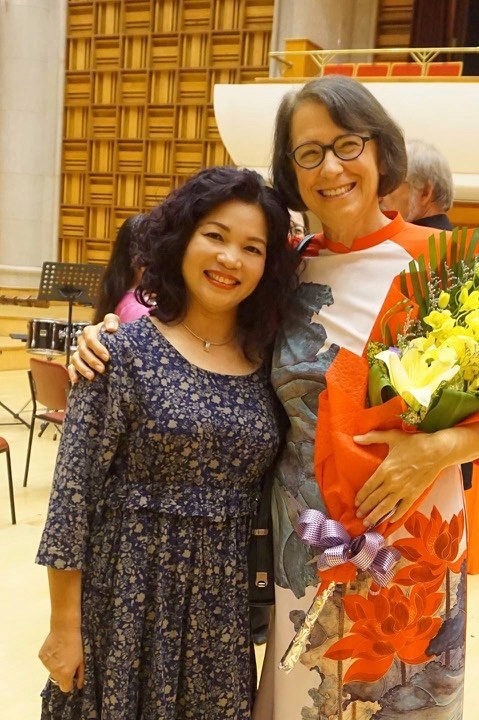 With violinist Pham Trương Sơn. Jan with our Vietnamese teacher Tran Thu Thủy. A Chivas Regal toast at our bon voyage party. Expect many more stories in my upcoming blog posts, as I have a lot of inside information on street food, culture, side trips galore I think you will enjoy. And I need to continue to study Vietnamese for an eventual return trip for another chapter shaping the Hà Nội New Music Ensemble and its development into a great group capable of playing anything under the sun. Our best friend Hưởng at Quan an Ngon restaurant. Food is always the best way to learn a foreign language. Increasing vocabulary, buying vegetables from friendly market people, ordering in a restaurant, all help unlock keys to speaking. Make no mistake, my Vietnamese is only improved in pronunciation, vocabulary and basic sentences, as is my ability to from time to time call out bar numbers and starting points in Vietnamese during rehearsals. But Hương, the young woman in the above photo was the perfect person helping Jan and me learn to speak her language. We often visited Quan an Ngon for a quick bite, as it was close to where we were staying. She would only speak to us in Vietnamese, slowly, patiently, but she would not lapse into English as a default, and we made of point of sitting in her section of the restaurant. 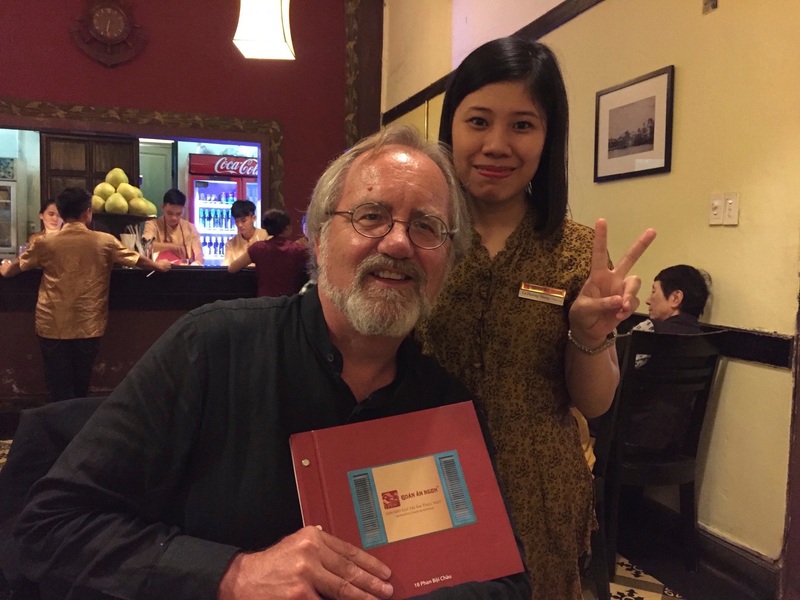 And, with her patient help, we eventually were able to order our meal in fluent Vietnamese, which now feels like winning a linguistic World Series. With my young friends at Cộng Cà Phê. Early on in my two month residence, I apologized to them once, in English, that my Vietnamese was not very good. The young answer I received sums up their world view, one that reaches back centuries into a Confucian past while yearning for a happy and bright future where everyone is welcome to their country. 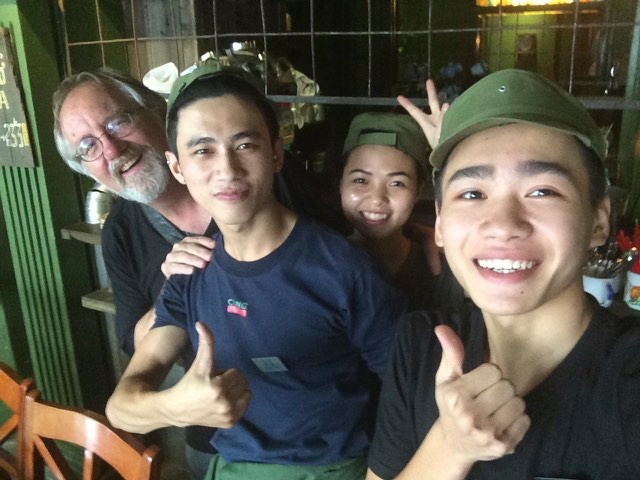 Working as an American in Việt Nam is always rewarding. Our countries were joined at first by a tragic and painful period of history. But we are in a different cycle now. Jan and I are honored to transform our relationship into a bright new chapter through their ancient and new music. Yes, I’ve returned to California but I left my heart again in Việt Nam, where by listening to the past you can hear the future.